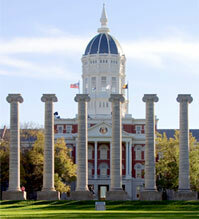 University of Missouri average debt load is nearly $10,000 less than the national average. COLUMBIA, Mo. –Experts are concerned that college students are making ill-informed student loan decisions with potentially negative consequences to themselves and the economy. As a result, universities are trying to ‘think outside the box’ to find ways to reduce undergraduate borrowing and help assist students in making better financial choices. At the University of Missouri, initiatives within the financial aid office, backed by new research from the Truman School of Public Affairs, are showing that establishing relationships, more than merely providing information, is important when helping students make better financial decisions. Prewett points to the “proactive” philosophy of the MU Financial Aid office as an explanation of why MU’s average debt load of $21,000 is less than the national average debt of $30,000. One intervention being used is the practice of sending debt letters to all student borrowers; these letters include information about debt accrued, estimated monthly payment and remaining borrowing eligibility. Rajeev Darolia, assistant professor of public affairs, partnered with the MU Financial Aid office to test the role information from a debt letter plays in borrowing decisions. Using financial aid records, the experiment identified non-graduating undergraduate students who had obtained student loans during their time at MU. Half of the group were randomly assigned to receive the official letter, while the other half did not. Darolia found that the letter, in isolation, did not have an overall effect on borrowing. While there was no difference in borrowing, one important outcome was noted—students who received the letter came to the financial aid office at a much higher rate than those who did not. Darolia’s paper “An Experiment on Information Use in College Student Loan Decisions,” recently was published by the Federal Reserve Bank of Philadelphia Research Department. Darolia is a visiting scholar for the payment cards center at the Federal Reserve Bank of Philadelphia. Editor’s note: A step-by-step checklist is one example of how the MU Financial aid office works with students to help them understand their student loans.